Inline skating is a wonderful sport and a great way to get exercise and keep fit.Inline skating, otherwise known as 'rollerblading', thanks to the brand of inline skates that the sport is so well known for, can bring health benefits as skating burns up calories at the rate of around 350 calories in 30 minutes. It also helps tone the buttocks, legs back and shoulders, and gives you a great cardio workout. It's no wonder that it's popular with people from all walks of life. Along with the great exercise and pleasure inline skating can bring there are some important safety measures that need to be taken to avoid injury and accidents. Check wheels are free of dirt or oil. Check your wheels aren't wobbly or loose. Check your axles and nuts are firmly in place. Check your brake is not worn or has become unattached. Replace any worn or faulty parts. Make sure you are wearing the proper safety clothing and equipment. You should be wearing a helmet, along with wrist, knee, and elbow protection. Do some warm up stretching before you put your skates on. Stretch your lower back, abdominal muscles, calves and hamstrings in particular. Make sure your helmet fits properly and is secured before skating. Don't skate in areas where rollerblading or skating is prohibited. The highway-code applies to skaters on the road too. Cross the road as you would if you were a pedestrian and obey traffic lights etc. Young children should only skate on the pavement not the road. Take into consideration road hazards, like debris, bumps and other obstacles. Don't skate in an environment that is beyond your skill level. Be aware of your surroundings at all times. Watch out for traffic and pedestrians, especially old people and children. Never skate into oncoming traffic. Don't make any sudden wild manoeuvres if rollerblading on the road. Watch your speed. Never go faster than your skill level permits. If you feel you are going too fast, slow down. Keep relaxed. It's important you keep relaxed when you encounter any bumps or obstacles; it's the only way you'll get over them. Never lean back on your skates. Avoid loose gravel, leaves and water wherever possible. Take into consideration the weather conditions and adjust your speed accordingly. Carry a whistle, shout, or clap your hands to let others know you are approaching. Always skate on the left and pass on the right, use hand signals to indicate the movement you are going to make. Be considerate to other skaters and pedestrians. 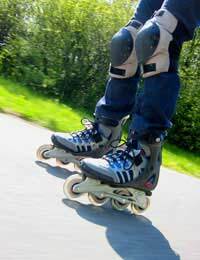 Keeping these safety tips in mind should make rollerblading an enjoyable experience.